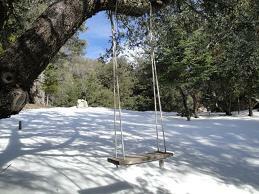 Since the 1920's, this family has had a love affair with Palomar Mountain. The star gazing has always been wonderful with our clear night sky. You can sit out and watch the moon rise, from the deck or living room. The Beautiful Moon… Such peaceful views, carpeted with daffodils in the spring. Vintage fixer add-on of 812 sf with two bedrooms, a kitchen, and dining area from 1961 all on a half acre. A 22x15 living room was added later, now with double pane windows and a very efficient wood stove. 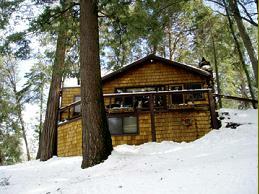 The owner said, "It's the perfect cabin to be warm and toasty during the snow that we always loved so much. When we would arrive, and the bones of the cabin were cold, we'd build a big fire in the woodstove. I'd always put a chicken in the oven, and often baked a cake. Before we knew it, the cabin was warm and dinner was ready." What needs to be done? The woodpeckers have been very happy here so it is time for all new siding after you work on the foundation. Lots of room for your tools with a walk-out basement and laundry room. Owner's Grandfather developed "Campsites' nearly 100 years ago! Underground power and phone to the property line and an excellent well. 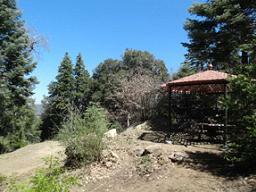 Building site with-a-view waiting for your dream mountain getaway. Meanwhile enjoy charming log 'Shabin' complete an enchanting picnic site among the magnificent boulders and majestic oaks, cedars and firs. The road in is gated and locked so this is not a property to drive by and explore on your own. First cabin to sell twice in one year, and first cabin for me to have a part in for the 6th time! Don't look for this to be back on the market anytime soon though. 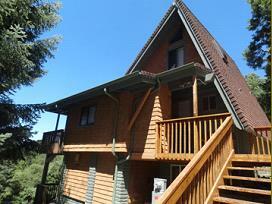 It was purchased by a neighbor to have as another absolutely charming vacation rental. The bagpipes are gone now, but the music remains. This cabin went quick. Such a nice setting for one of my little favorites on Palomar. Click for a little more info including the website from the last sale. Sold to a neighbor before I got it up! Underground power and phone to the property line and an excellent well. Building site with-a-view waiting for a mountain getaway. Beautifully groomed with the view opened up looking to the snow on San Jaciento! You see the Observatory and High Point Lookout! You'll be impressed with all the work that has been done with the County, and the building plan ideas the owner has for you. Your meter is installed with Palomar Mutual Water Company. You have a recorded survey, required agency clearance, pre-approved septic layout, school fees paid, maps and more below. Click for a new album showing the beautiful gazebo the seller built and a peek at our Four Seasons. 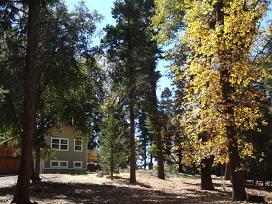 The trees are laced and property groomed which opened up a surprising view to High Point Lookout. Charming, peaceful cabin in the woods. 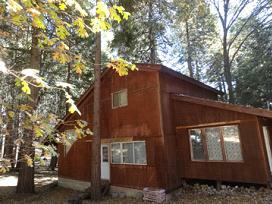 This little delight has a knotty pine interior and big stone fireplace. So warm and inviting, this vintage cabin from 1928, but restored and remodeled along the way makes it such a pleasure to enjoy year round. Two sleeping rooms in 900 sf, plus basement laundry and storage room. But, that's not all! There is also a tiny shabin that was a bunk house in the past that needs your love. Plan your weekend escapes or a step back in time, full time. Come see this Beauty in the Woods! 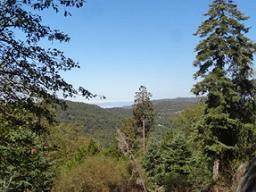 The outdoor living is delightful and you have beautiful views to the Observatories, through your well-groomed forest. 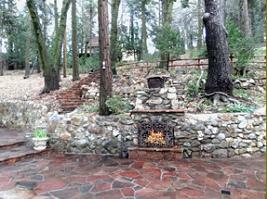 Extensive stone work frames the wrap-around decks and patio areas that have hosted such fun parties. Two very inviting outside fireplaces, and two inside. Year built shows 1975 and a lot has been added and updated along the way. 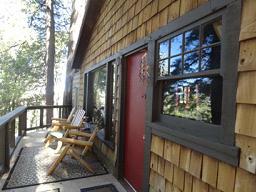 The painters just left, leaving some rooms neutral, and all fresh and clean, but this cabin could still use some love! 2122 sf with a living, and family room around the kitchen, and the master bedroom and bath, all on the walk-in level. Two bedrooms and a half bath upstairs. Downstairs has been a cozy home theatre/library, a large craft and laundry area, plus a charming sun room that could sleep a few more! Three nice sheds/storage areas. 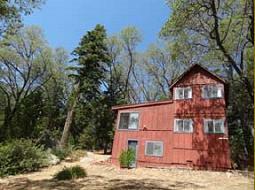 2/3 acre with the feel of a lot more land. Come savor the privacy and see if this is the one! Owners just finished up with the SDG&E and County permits and the power is on with a brand new 200 amp meter! With beginnings in 1949, this shell was framed in 1975 but unfinished. Some foundation work was done, a water meter is installed, and you can have phone service. Recently the septic tank was pumped and certified. A former owner had building plans drawn showing the original cabin as the master bedroom with a good-sized bathroom. You now walk in to a large open, soon to be "great room"--for you to make the way you'd like. The kitchen is on your right, with a sit-down center island planned , someday looking over to the wood burning stove in the family room corner,. The large living area presently has a ladder to the second floor where two bedrooms were planned with a Jack and Jill bathroom. Click for the MLS info and photos and click for an album and let's go see!! With the feel of a Downtown Loft, yet looking out to the beauty of the forest, this newly remodeled cabin awaits. 1037 square feet originally built in 1961 but in the last 7 years, so much is brand new. The chef in your family will love the kitchen with high end, stainless steel appliances, open to the living and dining area, high ceilings, lots of storage, double paned windows, and so much more. There is work left for you to do, finishing off a deck, fencing, and completing the bedroom remodel. Level half acre. Frontage on Crestline and lots of parking. This one is a gem! MLS Info and photos and here is an Album to click through. SOLD Honey, Stop the Car! One of the most extensive and absolutely beautiful remodels on Palomar also has such a private and intoxicating view. "The deer are usually grazing in the meadow when we arrive", said the owner. They are sorry to leave their cabin, but retirement will be taking them out of state. The last few years have produced a brand new kitchen, new spiral stairs, carpet, fixtures, and a bathroom on each level. Two trex decks, underground utilities, a new paved driveway! 1200 sf with three sleeping area plus a loft for the grandkids. Click to see some of the charm and views. Click for MLS info and come see! 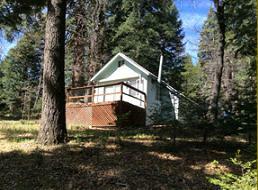 Cabin with lot next door totaling two acres plus a well.